Have you started decorating the kitchen and dining area for Halloween? Don’t forget to add a hauntingly cool charm with this Halloween-themed kitchenware and tableware. 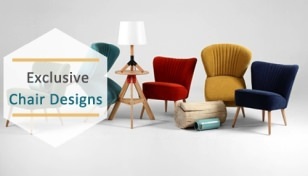 Whether you’re planning a full-course meal or just going to serve snacks to your guests, these devilish accessories will surely turn all your food and beverages into frightful delights. From bloody chopping board to skeleton wine glass, all these kitchen accessories will accentuate your Halloween-themed party. 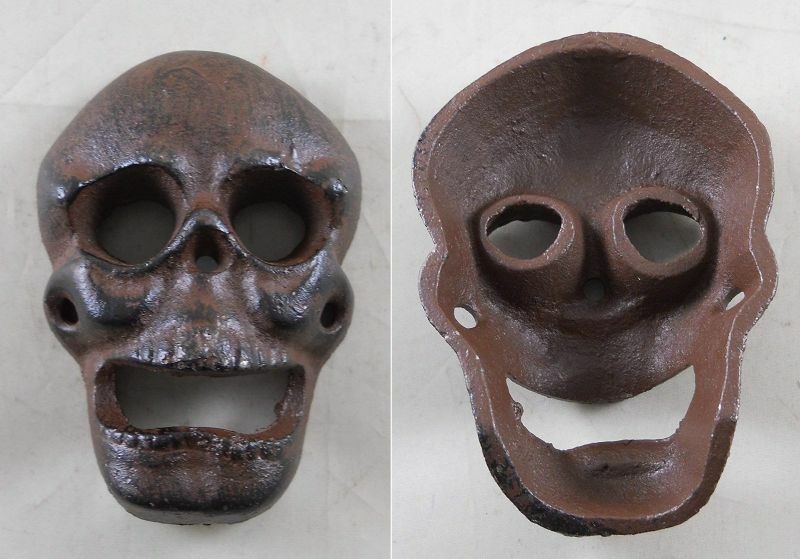 These utensils are spooky and practical at the same time, without being too gruesome. You’d surely want to put these eerie kitchen utensils on display during the darkest hour of the creepy October 31, night. This spooky bowl and spoon combo, meant to look ghoulish on your table, is made from ceramic with decorative sutures. If you may, you can use it to serve sugar. This hyper-realistic human skull is cast from custom molds with hand poured food grade resins. It holds 16 fluid ounces. It’s good for a scare but not safe for the microwave. 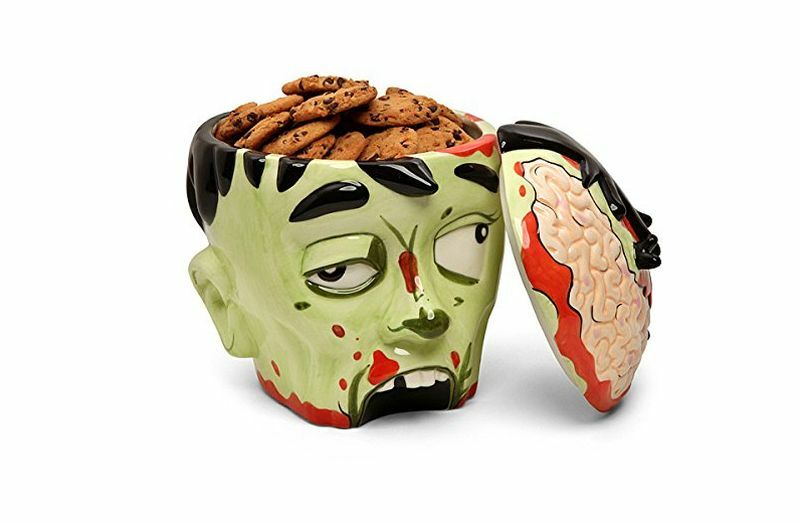 Measuring 9″ tall and 7″ wide, it is a ceramic jar in shape of a zombie head, perfect to keep cookies and Halloween candy. 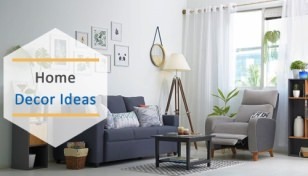 Ask the guest to lift off the top of his head to reach in for cookies – if they dare! 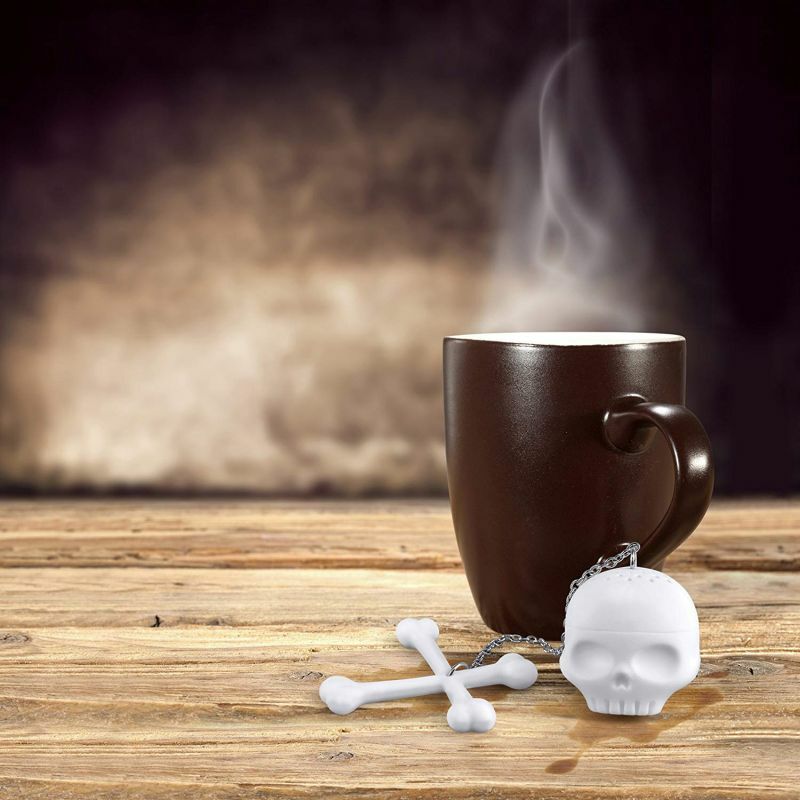 This spooky skull-shaped tea infuser will give you the creeps while it steeps. It brews you up a perfect cup of tea and is molded from pure, food-safe silicone. 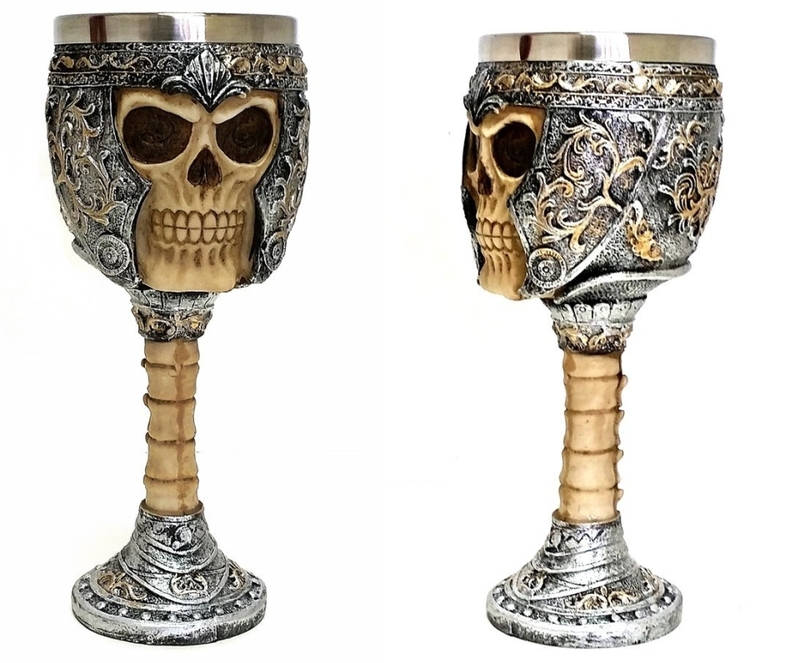 This stylish wine goblet features intricately detailed skull design. Made from high-quality polyresin, this will add a gothic feel to your dining table. 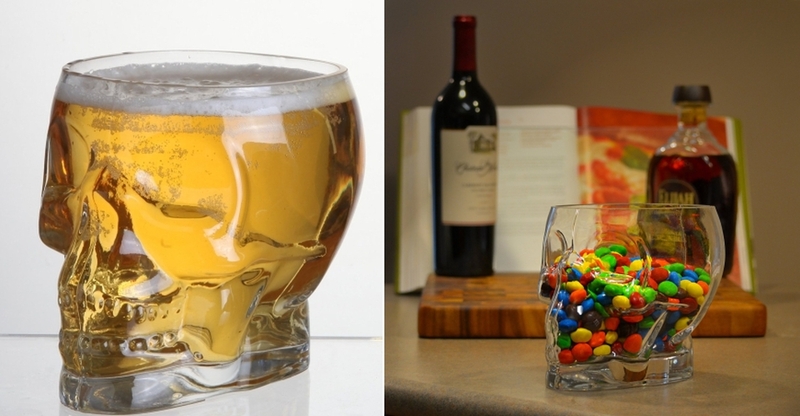 Skull-shaped glass can be used as a beer mug or double up as a decorative bowl to store colorful candies. 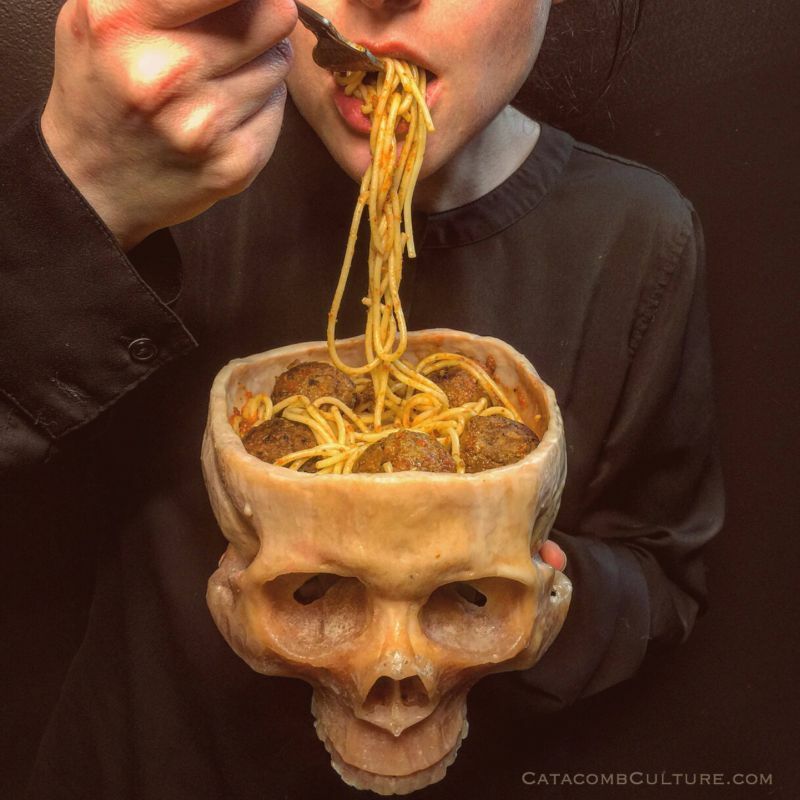 Fill it with a party drink to serve your guests a dose of creepiness. 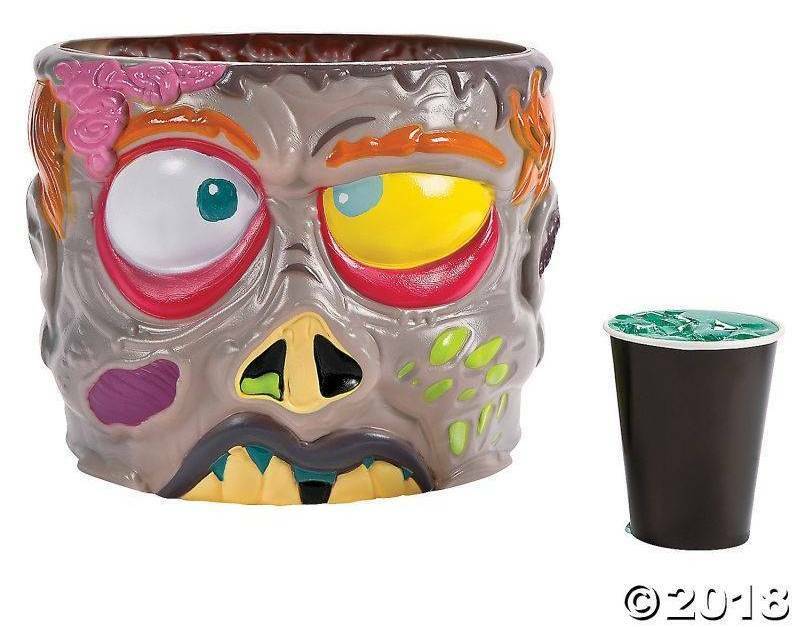 It’ll look best alongside other zombie cups. 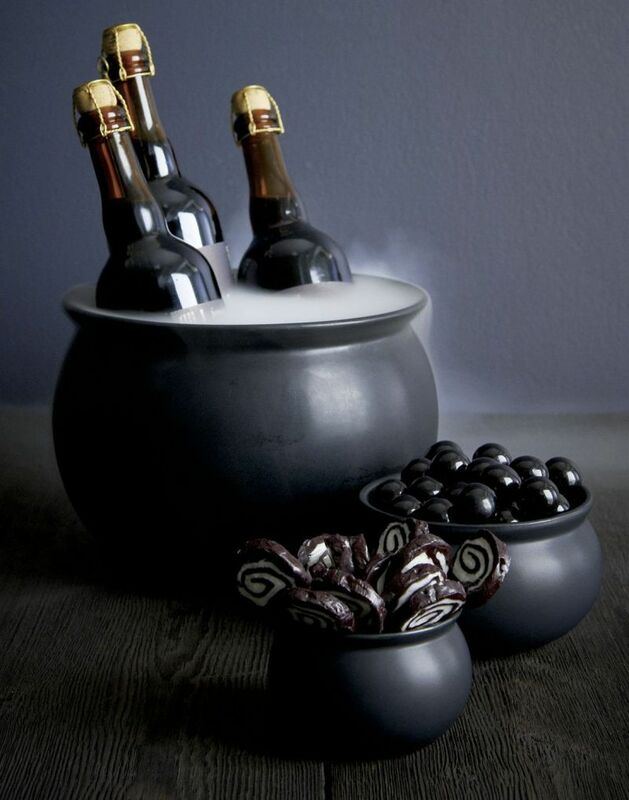 These cauldron-shaped and glazed iron black, ceramic stoneware bowls are perfect to serve Halloween punch, cookies, soups, and magic. 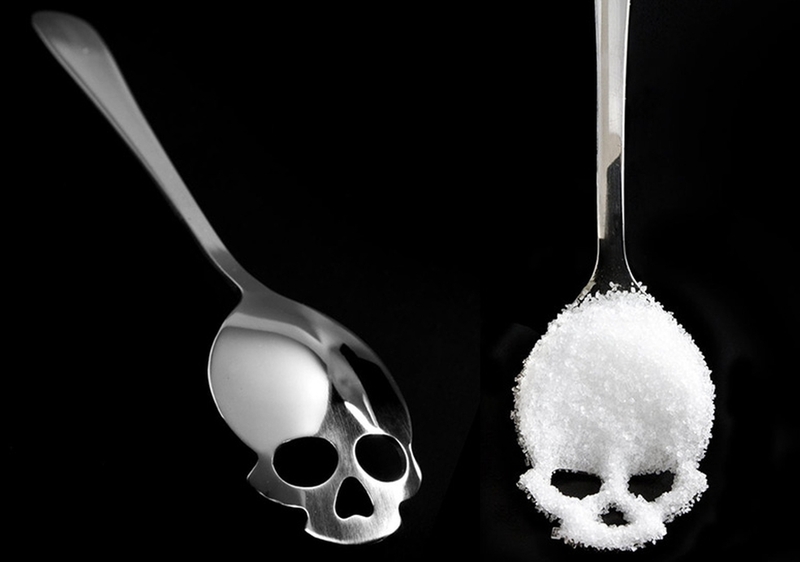 Add two teaspoons of horror to your cup of coffee with this skull-shaped teaspoon. It’s made from high-quality stainless steel. 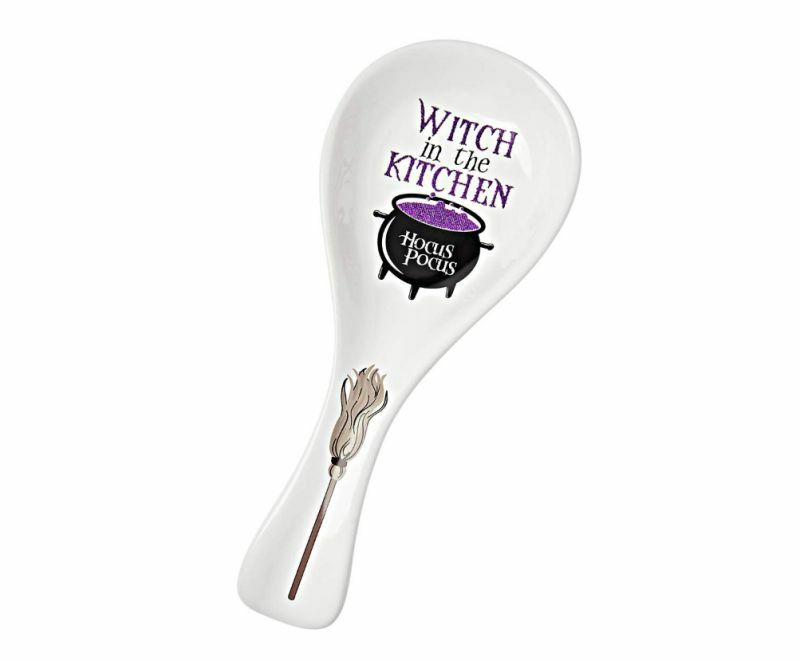 Add Halloween fun to your dining table with this spooky spoon rest that’s themed after the 1993 American comedy horror fantasy film Hocus Pocus. Toss and serve horror-filled salad to your guests with these creepy skeleton hands. BUT! Don’t poke them, please. 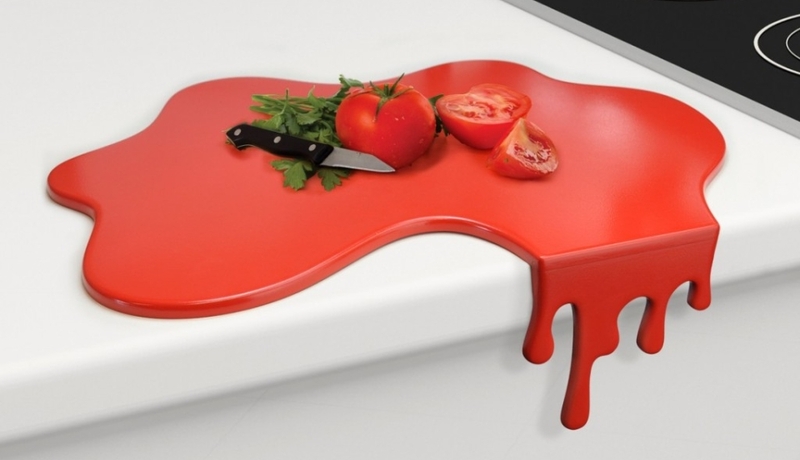 Chop veggies and meat loaves on this bloody red chopping board. Mind it, sitting there on your countertop it looks as if blood was dripping off your kitchen counter. This fun beverage cooler boasts jovial pumpkin art and serves as an elegant holder to keep your drinks cool. It really inflates to look cute than scary. But who said, cuteness is not Halloween ready. This gelatin mold shapes a delicious gelatin treat into a zombie’s brain. Are you ready to try the jello mold and freak the kids out? This spine-chilling bottle opener with a clenched claw is always ready to flip the top of your chilled beer. 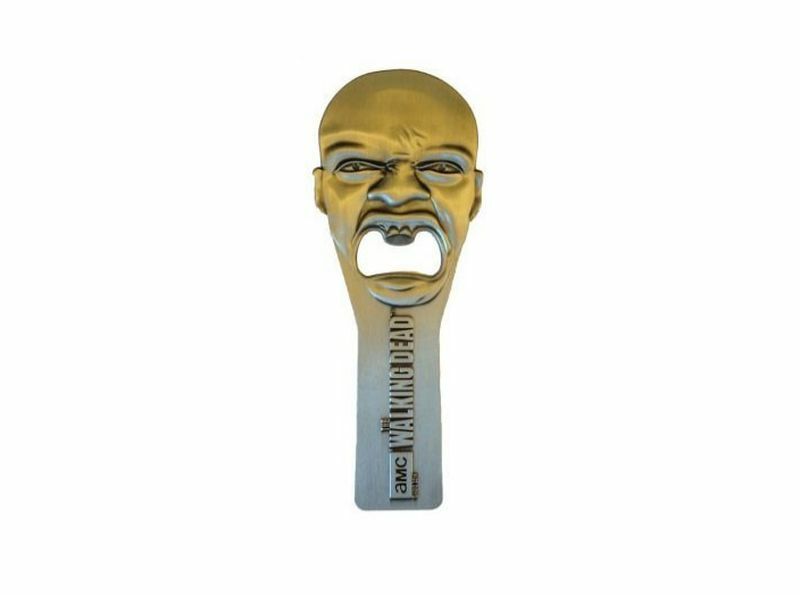 With a 2D relief design of a Walker head from hit AMC TV show, this opener is ready to crack open your favorite beverage. It is a perfect takeaway for The Walking Dead fans. Made from cast iron with a rustic brown finish, this wall-mounted skull bottle opener is a perfect addition to the kitchen this Halloween. 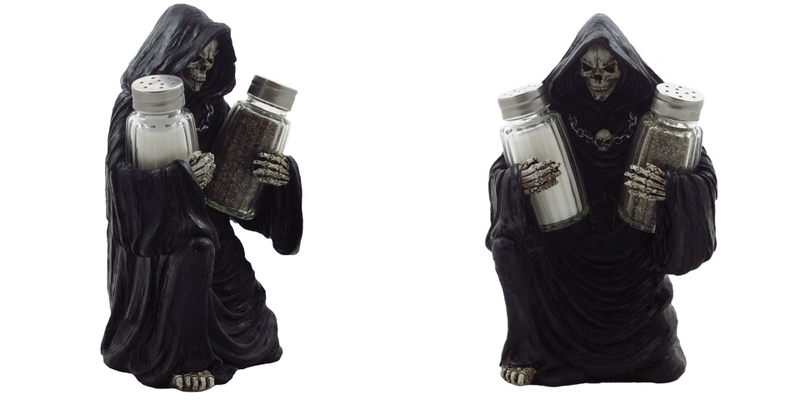 Cast that sinister shadow over your Halloween party with this salt and pepper shaker set featuring the Grim Reaper. 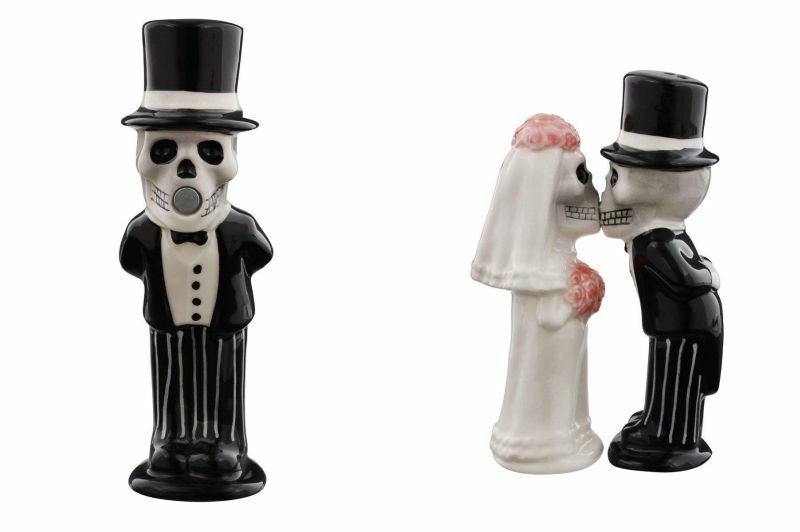 Enhance your table decor for Halloween with this pair of magnetic Bride & Groom Kissing Skeletons salt shakers. 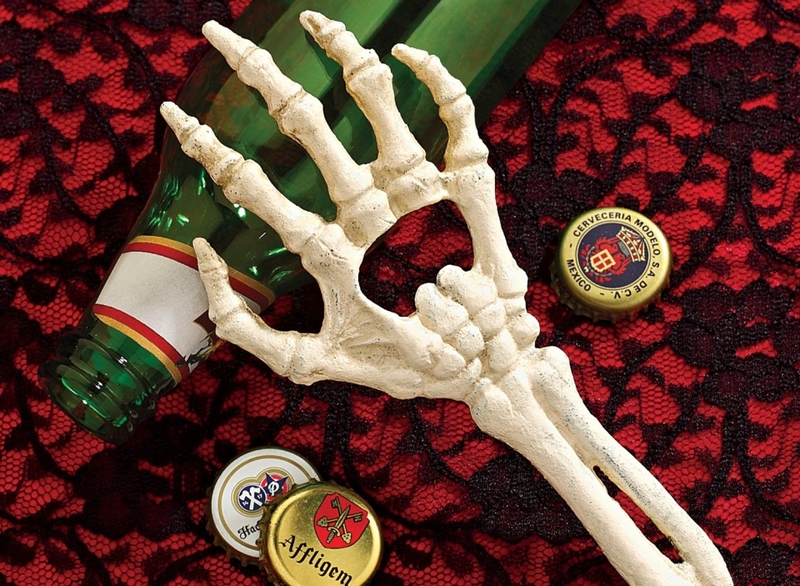 If you can’t have enough of skulls and skeletons, this ghoulish shaker set is yours to be. Embossing rolling pins are a necessary kitchen tool for Halloween. 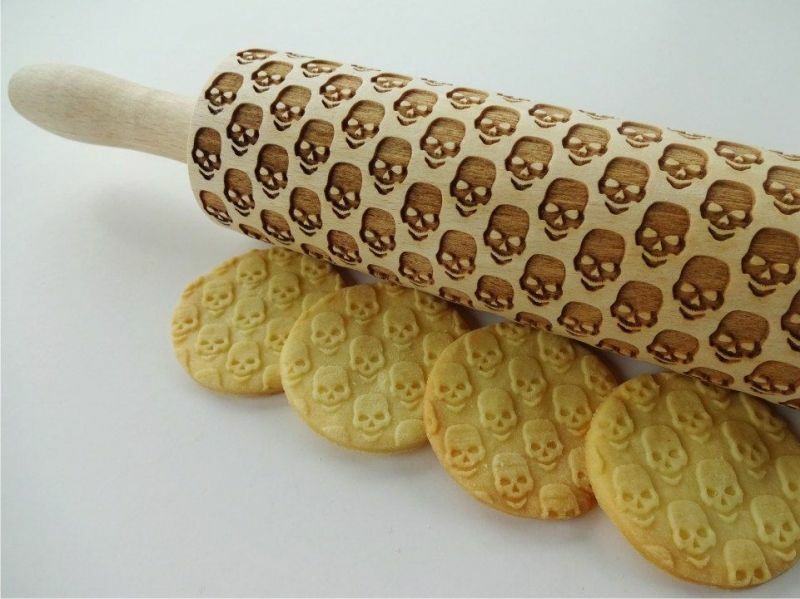 If you’re a baking fan, these will help you create embossed skull cookies for your kids – scary fun, right! 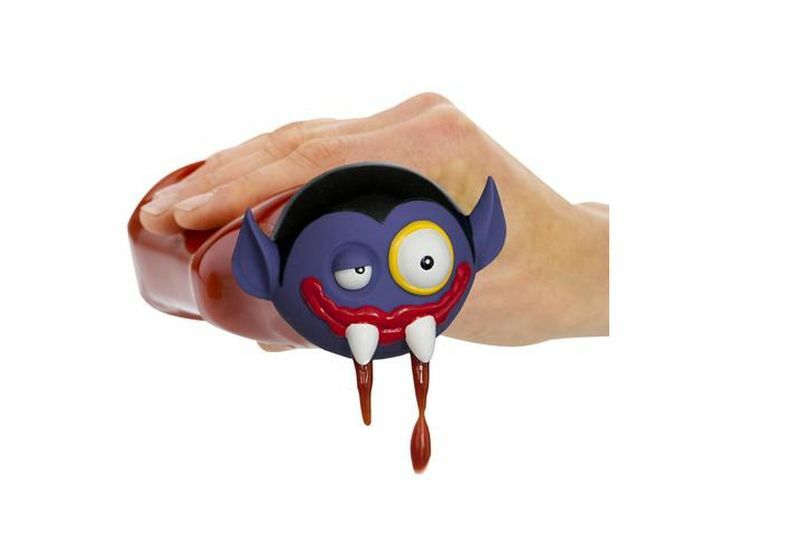 Replace your traditional ketchup bottle cap with this vampire head that drips your favorite condiment from its fangs all over your food. 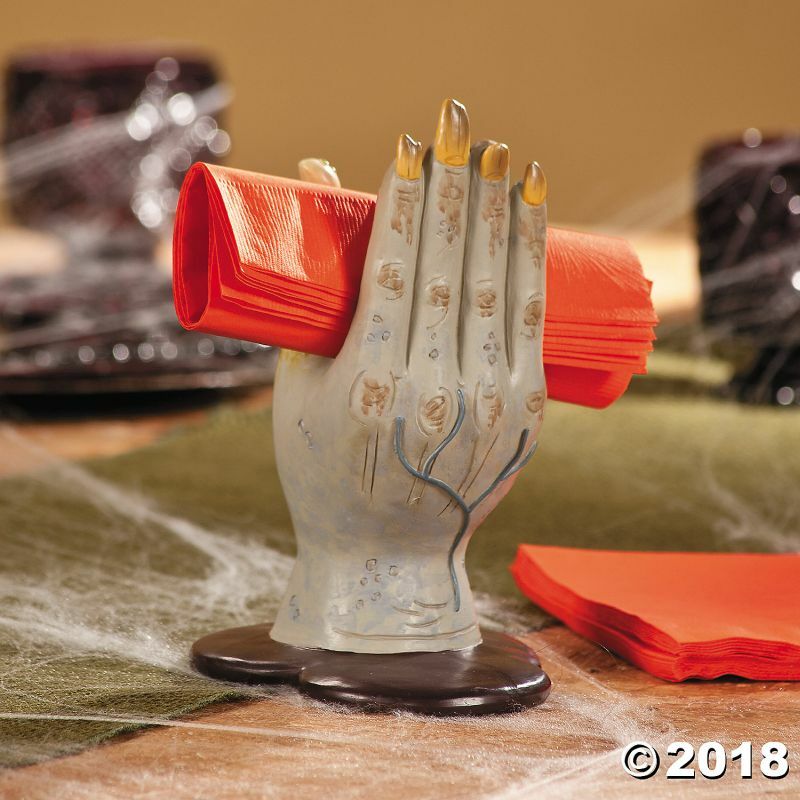 This handy Halloween tableware will creepishly climb to the dining table and hold napkins for you. 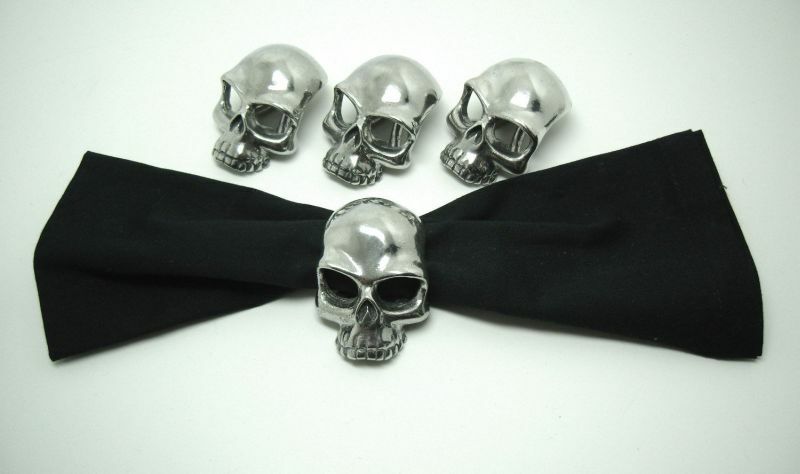 Inspired by the British reality television series Four Weddings, this is a set of four handcrafted skull rings for napkins. 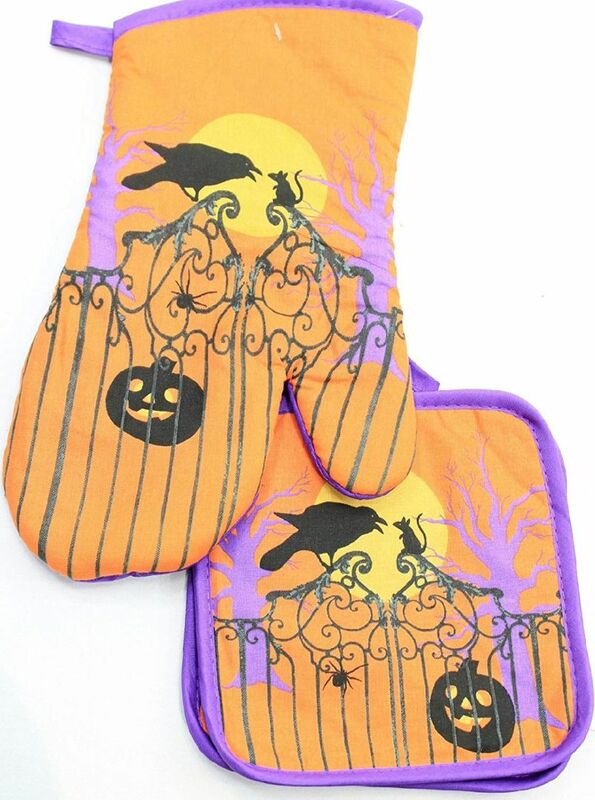 Add a whimsical touch to your kitchen with these Halloween-themed oven mitts. 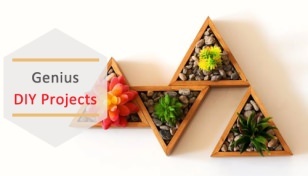 They’ll keep your hands safe and enhance your kitchen décor. Don’t walk into the living room wearing them else you’d freak the kids out. Looking for a spooky black lace decor accessory? 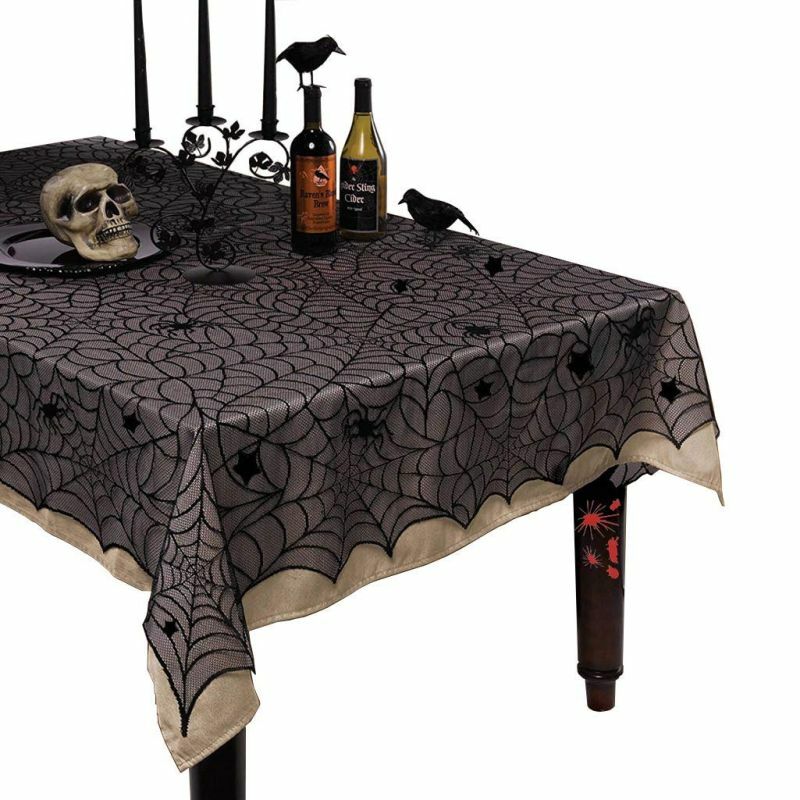 This spider web-themed tablecloth is ideal to increase mysterious ambiance in your Halloween. The scary ceramic plates will be a great addition to the dining table. They’re perfect to serve mouthwatering dishes and scare off the trick-or-treaters. 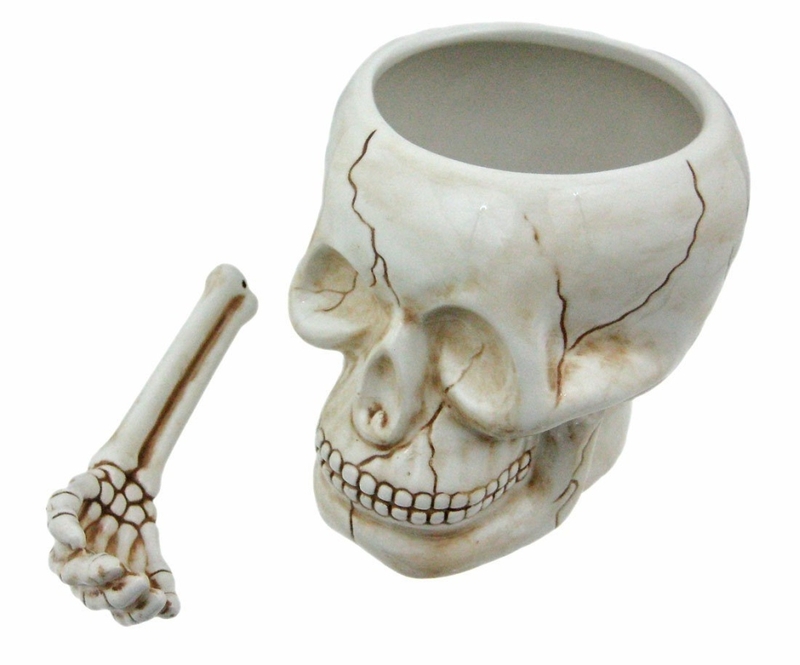 Scare the party with the hand-painted skeleton head-shaped mug. 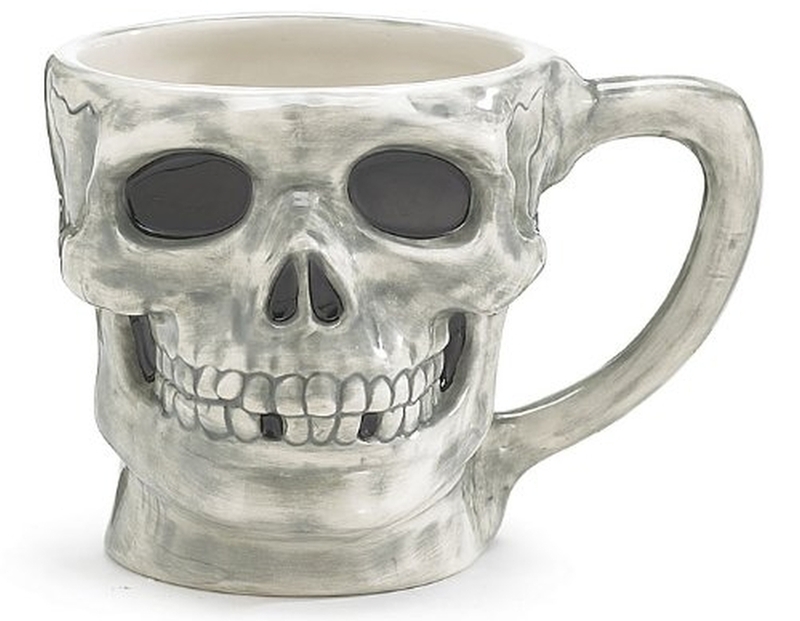 Serve piping hot coffee in this eerie mug and right away have a reaction. 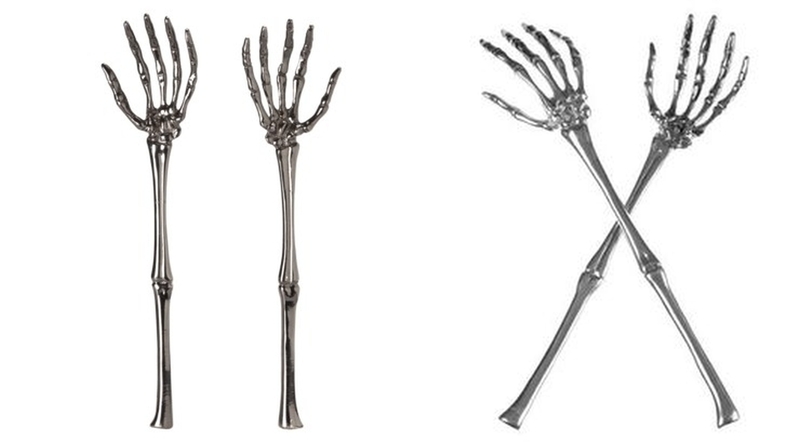 Welcome the trick or treat spirit, and dress up your dinner table with this devilish set of fork and knife.